Navigating through the site is quite easy and once you find the promo you want, you just have to point your cursor to your promo-of-choice and click the "view deal now" button. For the one above, I chose LBC as mode of payment. The one below was through Paypal. 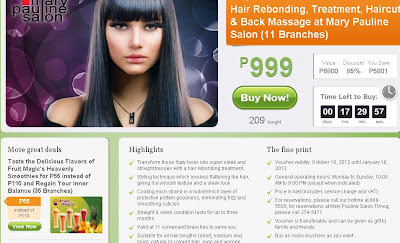 When I inquired at LBC branch, they told me that it would take two days before my voucher becomes available for printing. Hi! I checked on the fineprint of the ocean park deal i wanna buy but it indicated that the printed voucher is not valid on the entrance gate of the attraction.. how about that? Thank you! Hi! Sorry for the late reply. Yes, the printed voucher itself is not valid at the entrance of each attraction. You have to EXCHANGE the vouchers for TICKETS in metrodeal's booth inside the park. :) Hope this helps. :) Enjoy! May i ask if how can i get my voucher? ?it will be sent to my gmail account ? ?or where? Hi ms. Nads. I had the same error. What happened sa case niyo? Hi ms torres. 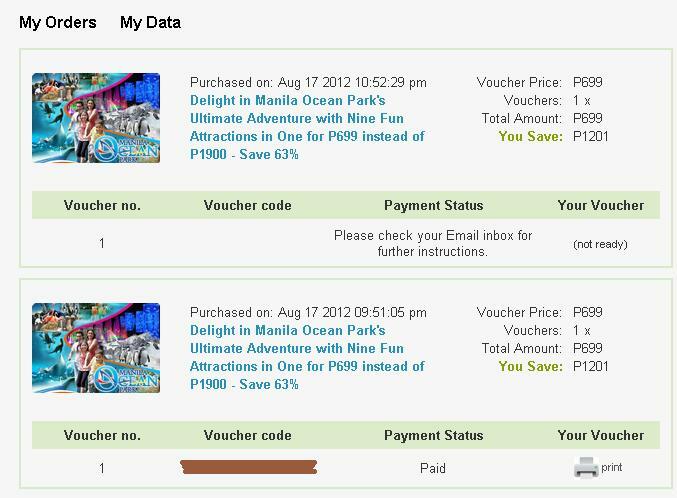 Im planning po sana na mag avail s metrodeal ng sa splash island. Panu po ba un db ang mode of payment through lbc or mga banks. E panu ko po makukuha un ticket ? Sa mismong splash island na po ba yun makukuha? Tulad ng sa ocean park n may booth cla dun? Salamat po in advance. Hi! Bibili po kase ako ng 2tix para sa star city. Halimbawa po, binayaran ko na ngayon, pwede na po ba siyang gamitin tmrw? Thank you! Hello. If I purchase a deal on the same day and pay for it through Dragonpay, BPI over-the-counter, will I be able to redeem it on that same day? Hi. I've wanted to try metrodeal for a discount they have on buffets, but I'm still confused. If I click the Buy Now option, what exactly am I paying for? The discounted price of what I want to avail? If so, do I still have to pay the restaurant I'll be presenting the voucher to? Hello, umorder po ako ng ticket and paid in my credit card, pano ko po maavail yung voucher, wala po sya sa myorder sa metrodeal app. And i already checked my email.Pano ko po sya makikita? Hello po kung oorder po ako ng 2 vouchers sa metro deal. makukuha ko po ung ticket by presenting my valid ID dba po? kelangan dn po ba ng kasama ko mag present ng VALID ID ? kase wala po syang valid ID. pero ako nmn po oorder. pag bumili po ako ng 2 vouchers sa metro deal. tapos po kukunin ko na po ung ticket sa manila ocean park pag pinresent ID ko. kelangan pa po ba ng kasama ko ung ID? or ibibigay na po sakin ung 2 ticket ID ko lang kelangan? wala po kase sya ID at ako lang po yung bumili? hello po. good day! itatanong ko lang po nagpurchase po ako ng voucher and yung deadline of payment nya po is yesterday. pwede pa rin po ba akong magbayad today? mavavalidate pa din po ba yun? yung event po will take place sa aug. 4-9 2016. salamat po sa response. hello po. nagpurchase po ako ng voucher sa metrodeal yung deadline of payment nya po is until yesterday lang. Possible pa po ba akong magbayad today? yung event po will take place sa Aug. 4-9 2016. thank you po for your response. Hi po, I ordered on Metro Deal, pero di ako nakapagbayad within the given date lumagpas na sya sa deadline, kpag nagbayad po ba ako ngayon pwede pa rin ako makakuha ng voucher kahit sold out na sya sa metro deal? Hi I bought tickets for ocean park and ill pay it later morning through lbc, question can we go to ocean park right after I pay through lbc? I need to know asap pls. When paying through lbc is it true that it will take 2 more days before the voucher be available for printing? Cant we just go to ocean park right after paying and just present the receipt instead? I need an answer asap please coz its my daughters birthday today.